In the fbs there are free floating support medium (small plastic form parts) or particles (produced from UV-stabilised polyethylene), on which bacteria grow. A biological layer (micro-organic colonisation) forms on this medium after a start-up period. The biofilm which consists mainly of aerobic organisms, transforms the organic contaminants contained in the wastewater into sedimentary and mineral substances. The wastewater is serated intermittently and the aeration system installed in the tank, supplies the organisms with sufficient oxygen and in addition, the aeration process causes a current that moves the fliud containing the biofilm medium and the entire content of the reactor is blended. 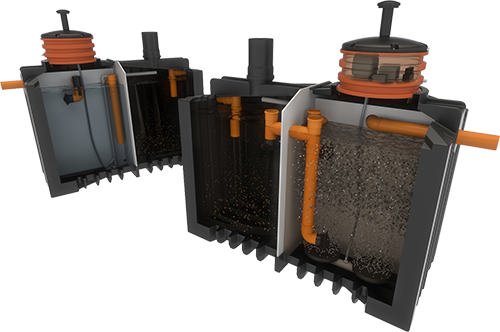 This technology requires no rotating parts in the wastewater. Return sludge is transported via a maintenance-free airlift-pump , operated with compressed air. The blower supplying the oxygen is placed outside the container near the control cabinet. Prior to the FBR biological stage, the raw wastewater is separated in this first stage by either mechanical separation or primary settlement depending on the project size. Particles in the wastewater that are smaller than 3mm pass through the screen and enter the fbs. The natural wastewater accumulation flows freely through the plant. 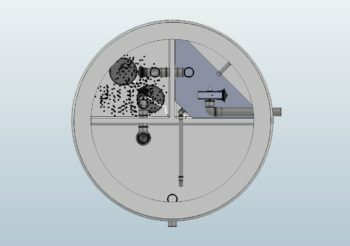 An integrated restriction valve controls wastewater flow to prevent shock loading and to make sure that the flow is equalised in order to optimise the physical and biological processes. In the fluidised bed container there are free floating support media (small plastic form parts) or particles (produced from UV-stabilised polyethylene), on which bacteria grow. A biological layer (micro-organic colonisation) forms on this medium after a start-up period. The biofilm which consists mainly of aerobic organisms, transforms the organic contaminants contained in the wastewater into sedimentary and mineral substances. The wastewater is aerated intermittently and the aeration system installed in the tank, supplies the organisms with sufficient oxygen. The aeration also causes a current that moves the fliud containing the biofilm medium and the entire content of the reactor is blended. 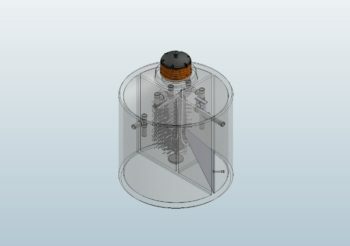 This technology requires no rotating parts in the wastewater. 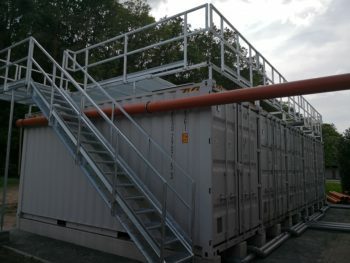 Sludge is transported via a maintenance-free airlift-pump, operated with compressed air back to the primary settlement zone. The blower supplying the oxygen is placed outside the container near the control cabinet. In the secondary sedimentation chamber, the cleaned wastewater is separated from the bio mass by sedimentation. 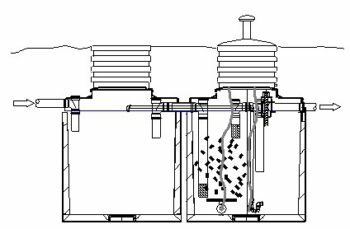 At preprogrammed intervals, an airlift-pump returns sedimented biomass as surplus sludge back into the pre-chamber as programmed. The main advantage of a ClearFox fluidised bed procedure is the high biomass concentration (>21gTS/L) which allows for a small reactor design. This saves costs while reaching a high cleaning performance.